On the evening of Saturday, the 19th April 1941, a German bomber dropped a landmine on parachute which exploded All Saints’ Church. It killed five people waiting at a bus stop, an air-raid warden and messenger who were just going on duty. It demolished half the church and wrecked the vicarage, houses and shops were devastated. The vicar’s sister was also killed and the vicar, Henry Baker, and his other sister badly injured. At the time, a Canadian field Ambulance Unit, the 9th, and some units of the Royal Canadian Engineers were stationed nearby. In that Field Ambulance Unit was an Anglican Priest the Revd. George Hedley Wolfendale. He had enlisted as a private soldier but later became an army chaplain. He had a dream of building the people of All Saints’ a new church, using the materials from the ruined church and vicarage, and the voluntary labours of the Canadian Engineers to whom he now ministered. On the 22nd March 1943 the work was begun. In an incredible five weeks the church was completed, the only materials being paid for being the cement and the paint. Eighteen Canadian Engineers did the work and the resulting church was consecrated by the Bishop of Southwark on Easter Day, the 25th April 1943. In the week of the D Day commemorations it seems appropriate too to remember this more local but still powerful memory. I was there this morning celebrating the work so far on building a link between the present All Saints Church and the Hall. 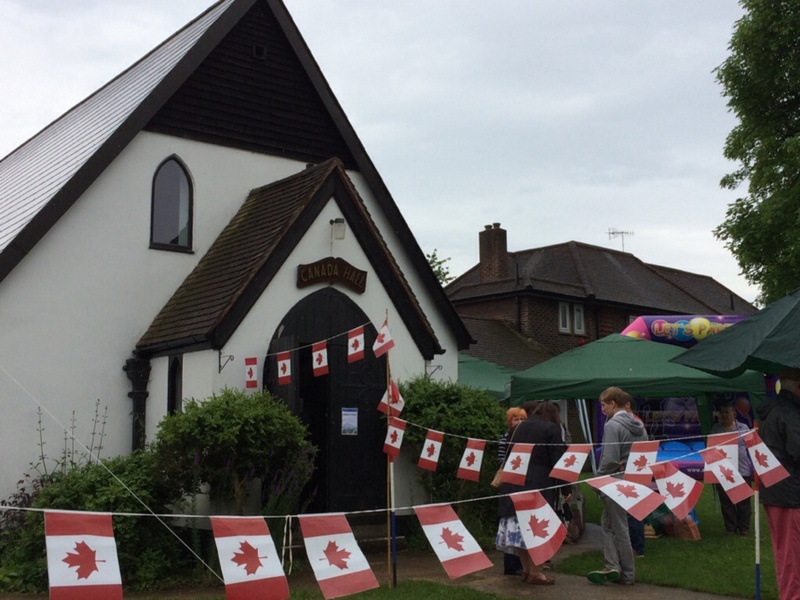 it seems very appropriately symbolic that a building which in itself symbolises a link between people in Britain and in Canada should itself be linked to the church for which it was itself originally a replacement. Canada Hall does look quite Canadian in its simplicity and straightforwardness. It’s also a reminder that the things we should not forget are not restricted to warfare and those who died. We should also remember, and treasure, our relationships and our benefactors. Canada Hall does that in the best way possible, by providing a space in which new relationships are formed through community activities of all kinds. It was built in response to destruction, but way beyond the plans of its original builders (I wonder if any are still alive?) it is still giving life. As a Canadian I am proud that our troops rose to the occasion and helped out a victim of the bombing. In spite of all the negative publicity about separatism I feel that the majority of our people value our British roots and honour our connection with the Queen and Commonweath. My sister and I were baptized in this church as infants. Were able to visit Canada Hall when we visited Merstham a few years ago. My mother met my father when he was stationed near by.